Of course it does. The Smoke Stomper has the right combination of power and filter technology to handle the difficult air pollution caused by tobacco smoke. Just look at all our customer feedback as proof of it's performance. The great news is that it is capable of capturing both the smoke particles as well as absorbing much of the odors. And with our Commercial Grade Filtration, you can rest assured that the machine is capable of removing the most difficult smoke from your home. The Smoke Stomper Home Smoke Eater uses a 3-Stage Commercial Grade filtering process to remove the smoke particles as well as the gases, fumes and odors from tobacco smoke. Here are the filters included with the machine. As you can see, these are not some tiny filters you'd find in a department store air purifier that was NEVER designed to handle smoke. Is the Smoke Stomper Home Smoke Eater Noisy? No, on high speed, you get 350 CFM of fan power at just 63 decibels of noise level. To put this in perspective, competing machines are up to 71 decibels. If you do your research on noise levels, 10 db of noise is perceived to be 2 times louder. This means that competing models will seem twice as loud compared to ours. Bottom line is that if you buy a competing machine that is 71 db, you won't want to be in the same room with it when it's turned on high. You'll end up turning it down to a low fan speed and that defeats the purpose since the lower fan speeds will take considerably longer to clean the air. It all depends on the amount of smoke you throw at this machine. How will I know it's time to change the filter? Does a light go on? There is no "filter change" light that goes on. Usually these lights are based on airflow pressure switches. They are designed to sense when the airflow has been restricted to a certain level and turn a light on when it believes the filter is full. In my experience, these pressure switches are less than accurate. They turn on too early, or they don't turn on soon enough. Bottom line is that they aren't accurate enough to provide you a benefit. Other machines don't care how much pollution there is in a home. They set the machine up to turn on a light after a certain number of hours. There's no way that can be a useful measure of whether or not the filters need to be changed since one customer may smoke two cigaretts a day and another customer might smoke 40. So, it all depends on the smoke levels. Visual inspection of the filter. If it is gray or black and layered with smoke particles - it's time to change it. Use your nose. You may notice after a certain period of time that the odors begin to linger longer than when you had a new filter in. This is because the carbon filters get saturated and can no longer absorb any more gases, fumes and odors. How hard is it to change the filters? Simple. On the front of the unit you will see four silver pins. Pull them out, the front grill will come out exposing the filters. Simply grab the filter, slide it into a plastic garbage bag and insert a new filter and close the back screen. Do not spray anything into the machine as it may affect the HEPA filter. If you want to clean the unit itself off, just use a damp cloth. Click to watch how easy it is to change the filter. A full years filter kit is just $260. That equates to just $21.66 a month or less than 73 cents a day to keep the air in your home free of smoke, protect your health, your family, your pets and your home. If you think that's a lot - just think about how much you are spending on the cigarettes or cigars. Buy your Smoke Stomper filters here. Can I buy filters at the local hardware store? Unfortunately no. They don't carry this line of filters. You can purchase your filters through us. Why wouldn't I want to use an electronic purifier where I don't have to replace filters? While this may seem tempting, they just don't work. Often these electronic air cleaners have NO carbon which means there is NO mechanism for dealing with odors. Plus, when they get dirty they just stop working altogether. See, the way they work is to attract the smoke to a metal collection plate which you then need to clean. Once these collection plates get a layer of smoke on them, the magnetic capability of the collection plate is minimized greatly. What happens? The new smoke just flies right through the machine and won't get picked up. Sure, you save on filters. But you won't have a machine that actually works. Will the Home Smoke Eater remove the odors? Yes, the Smoke Stomper Home Smoke Eater uses two levels of carbon filtration to focus on the odors from tobacco smoke. First there is a carbon pre-filter which serves a dual purpose. It will both capture the largest smoke particles (lengthening the life of the HEPA filter) but at the same time since it's a carbon pre-filter, it will also work to remove some of the odors. The next filter in line is an activated carbon panel which is the size of the machine and 1" deep. This carbon will absorb odors, gases and fumes released by tobacco smoke. Does it work on Cigars? Yes, cigar smoke is a little more agressive than cigarette smoke in that the particles are larger and there is more odor. However, the technology used in the Smoke Stomper Home Smoke Eater has proven very effective for both my cigarette and cigar smoking customers. Would the Home Smoke Eater work in a garage? Yes, there's no reason it won't work in a garage. I have guys over for poker parties sometimes and everyone smokes cigars. How well will it work for these poker parties? When it comes to smoke removal - it all gets down to a few factors. Airflow of the Smoke Eater versus the size of the space and the amount of smoke.The more smoke you have and the larger the space, the longer it will take. Why? because a bigger space or heavier smoke means more work that the machine has to do in order to keep up with the smoke being produced. With a 350 CFM fan - the Smoke Stomper will definitely clean up the air. The technology is proven. 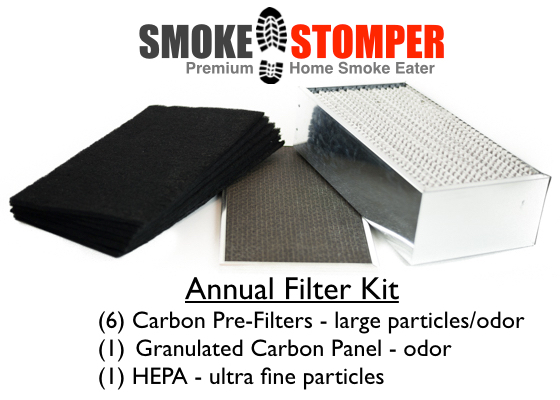 There is no doubt the filters in the Smoke Stomper remove smoke and odors. It's really a matter of time. The bigger the space, the longer it will take. With 4-6 guys all smoking cigars at once in a big basement or garage area. You may overwhelm a single Smoke Stomper. However, once the smoking stops, the Smoke Stomper will do a great job in cleaning up the air in the room. If you want better performance than one Smoke Stomper can provide, consider adding a second machine for distributed processing. Or, give us a call. We offer commercial grade smoke eaters that we sell for bars and restaurants. The big caution with a commercial smoke eater is noise level. The commercial machines are quite a bit louder and have some installation considerations. (size, mounting, etc) We can address any questions you have when you call. Toll Free 888-472-8736. Will the Home Smoke Eater work in a big finished basement? Read through the response given above for poker parties. When smoking in a large basement area, there is still a chance that the smoke may escape upstairs. Smoke rises by nature. And despite having a great air cleaner like the Smoke Stomper Home Smoke Eater - the reality is that it does not create a bubble surrounding the smoke, nor a barrier to prevent smoke from getting upstairs. The Smoke Stomper will dramatically minimize the smoke available to get upstairs - but may not eliminate that from happening completely. That's just the reality. You cannot stop smoke from rising. Plus in a home with central heating and cooling - it is possible that the airflow created by your heating and cooling system may still distribute the smoke. Why am I telling you this? I'd rather be completely truthful and lose a sale than not disclose information we know to be true. Despite the above disclosure, we have plenty of customers who are VERY pleased with the Smoke Stomper when used in their basement. I'm sure you will be too. Give a call if you have questions about your particular situation. Again, we are at Toll Free 888-472-8736. Will my family smell any smoke? Nothing is 100% or immediate. If your spouse is sitting on the couch with you as you smoke a cigar, yes, they will smell it. Again, a central heating or cooling system may circulate the smoke throughout parts of the home. You cannot stop that completely - especially if you smoke in an open area without doors. At the same time, the Smoke StomperHome Smoke Eater will make a dramatic and positive difference in the air quality in your home. What do you recommend for best performance? Dedicate a smoking room. Preferably a room with a door on it. Keep the door closed during smoking. Use a Smoke Stomper Home Smoke Eater in the room with you. Use weather stripping to seal the crack under the door. Or use a rolled up towel or a "draft dodger" sold in houseware stores. While this isn't required, it will minimize the smoke that can escape under the door and into the hallway. If there is a return air duct in the room (where air is sucked back into a central heating system) close it off with duct tape. If you don't, you will have smoke sucked into your ductwork and redistributed throughout your home. And again, despite having a great Home Smoke Eater in the room with you, it's not instant and some smoke may still get into the ductwork. Lastly - open a window a crack. This will eliminate what I call positive pressure and give the smoke an avenue of escape. That will minimize the gust of smoke that occurs when you open the door to leave the room. Click to watch a video where I walk you through this setup. What does the Smoke Stomper Home Smoke Eater cost? The price is $749 with a years worth of filters included and FREE shipping in the continental USA. Why does the Home Smoke Eater cost so much? Because the machine is built with a real wooden cabinet, it looks great - almost like a piece of furniture. Plus the wood cabinet provides noise dampening capabilities not available with metal or plastic cabinets. The motor is specially designed for quiet operation. Plus, add in the filtering technology that is capable of removing the smoke and odors while still being simple to maintain - it's a great piece of equipment. I've done the homework for you. Nothing cheap will come anywhere close to this in performance and quiet operation. The fact that it looks great is a bonus. I wish we could sell something for $300 bucks that actually worked. Unfortunately, nothing that cheap actually works. Are you saying this is the only product that works? IQAir GC MultiGas - Price $1149. Based on moderate to heavy smoking - you can expect to spend over $400 a year on filters. Max fan speed on high is 260 CFM and is a LOUD 71.9 decibels. Almost 8 db louder than our Smoke StomperHome Smoke Eater. I'll leave it to you which machine would look nicer in your den or living room. With Moderate to heavy smoking, you can expect to replace the carbon filters once a year at $299, pre-filters every couple months. 8-Pack is $99 so assume that's once a year - and a HEPA filter at $60 every one to two years or so. Total it up and it's about $400 a year or more. Combine that with a weak 129 CFM fan - it will take four times longer for this machine to clean the air compared to the Smoke Stomper Home Smoke Eater. Plus, the design is such that it would look awful in a nicely furnished room. Where do I put my Smoke Stomper Home Smoke Eater? Proximity matters. Placing it near the smoker will work better than putting it on the other side of the room. The only thing to consider is that you don't want to restrict airflow by tucking it too far in a corner or up against a wall. The back of the machine is where it draws the smoke in. Please leave 8-10 inches between the back of the machine and the wall or nearby furniture. Can I put it on a shelf or table? You can place it on a shelf or table, but there are two concerns. In either case, you will want to remove the wheels from the bottom so it doesn't roll off the shelf or table and fall to the floor. If you want to place it on a shelf, be sure that the shelf can support the 45 lbs of weight. Lastly, if you place it on a shelf, you will need to have it with the filter side facing outwards. If not, the filter will be tight against a wall and it will get no air circulation. This would cause the performance to suffer greatly. No, this model is designed as a floor console and is not moutable to a ceiling. If you need more of a commercial ceiling mounted application, we do have access to the same technology which is ceiling mountable. These commercial grade ceiling mounted units starting at approximately $1,225. Call us to discuss your specific situation: Toll Free 1-888-472-8736. Weight is approximately 40 lbs. Is it heavy? Can I move it from room to room? The weight and size are noted above. The machine is also on wheels so it is simple to unplug it and roll it from room to room. However, if stairs are involved, an able bodied person would be needed to carry it up or down the stairs. What can I do if smoke drifts to other parts of the home? You can experiment with different placements of the Smoke Stomper Home Smoke Eater in the room where you are smoking. Sometimes moving it a little makes a difference in how much smoke is grabbed quickly. If you cannot get the results you seek, consider setting up a dedicated smoking room within your home. See my recommendations here. Lastly, if you are using a Smoke Stomper Home Smoke Eater and still want the best results for your entire home, give us a call. We have some whole house equipment available that can be used along with your Smoke Stomper to provide the ultimate in whole house coverage. Call us to discuss your specific situation: Toll Free 1-888-472-8736. Why don't you sell other makes and models? I could carry pretty much any brand I want. With my industry experience, the manufacturers would love to have me offer their lineup. But I don't want be like my competitors. See, when you go to other "air purifier" websites, you find dozens of products of all different price ranges. And they let YOU decide what is best. I don't know about you, but I get confused looking at all of the options. And I'm a certified air quality guy. I've done the homework for you. I've done the research. I've tested and checked things out and have come to the conclusion that this Smoke Stomper Home Smoke Eater is the product I would want for my own home. I'm not going to confuse you by offering you ten different cheaper machines that give lousy results. Plus it's the only machine I feel comfortable backing with my 90 day no questions asked satisfaction guarantee. I used to offer other products for home smoke removal. I got way too many back from unhappy customers. I almost never get returns on the Smoke Stomper Home Smoke Eater and that's good for my customers and good for my business. The Smoke Stomper Home Smoke Eater has an unheard of 10 year warranty. As long as you change the fitlers on schedule as recommended, we will make sure any problems are repaired for you. How long is the guarantee / trial period? "If you are not absolutely thrilled with your new home smoke eater, I'll take it back and refund 100% of your money. Absolutely NO Hassle, No Restocking fee and no charge for used or dirty filters. You'll be able to tell for yourself how great it works within 1-2 days. But I'm going to give you a full 90 Days to check things out and make sure you are completely satisfied with the performance. With a full 90 days, you'll be able to see how easy it is to maintain it and make sure you are comfortable with how often you will need to change the filters based on your specific smoking levels. Check out competing websites for air purifiers. Most will have restocking fees or charge you for dirty filters. My take is that if the machine doesn't work as promised, why should YOU have to eat the cost of the dirty filters? I'll take that risk for you. Simply call us Toll Free: 1-888-472-8736 and tell us you want to return the machine. We'll give you the return address and authorization number. We recommend you keep the original box on hand until you are sure you are going to keep the machine. It's a large air cleaner and not easy to box if you throw out the original carton. Also, please insure the machine so you have some protection in the event that it gets damaged in transit on it's way back to us. If I return it, how long will it take to get my refund? You will be refunded within 24-48 hours after we receive the returned item and have had a chance to inspect it for damage above and beyond normal wear and tear. This site, HomeSmokeEater.com launched in August of 2008. However, we have been operating My-Air-Purifier.com since August of 2004 and a prior air purification website since November of 2003. 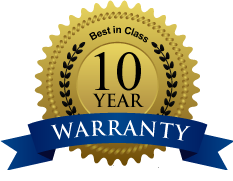 That's 11 years of backing our products with a 60-90 day return policy and having to deliver products that actually work. Believe me, when you have to stand behind your products, you learn quickly what works and what doesn't. My manufacturing facility who makes the Smoke Stomper for me has been solving tobacco smoke problems for the past 30 years. Why isn't anyone else selling the Smoke Stomper home smoke eater? Currently we are only selling direct to customers. You will find the Smoke Stomper on Amazon and we may partner with some other websites in the future and allow others to offer the Smoke Stomper for sale. Can I open a window while this is running? Yes, there is no reason why opening a window will negatively affect performance. As a matter of fact, opening a window will do two things. Allow some of the smoke to escape and allow fresh air into the home. Both of which will provide cleaner air. Do I need to close the door? As I mentioned above, closing the door will help to contain the smoke and allow the Home Smoke Eater more time to remove the smoke from the air. It will definitely help the performance and minimize the amount of smoke that escapes the room and drifts down the hall. How long do I keep it running? This is a matter of preference. Many of my customers keep the machine running 24 hours a day 7 days a week. At a minimum, I would suggest running the machine during smoking and for a period of time afterwards until the smoke has cleared to your satisfaction. Clearly, the more you run it, the cleaner the air will be. I recommend you keep it on all the time for best results. The Smoke Stomper will use 300 Watts Max. Based on recent electricity charges in my region, running it 24 hours a day might cost approximately $0.40 to $0.50 cents a day. Your costs will vary depending on the electric costs in your region as well as usage. Does it work on other things besides smoke? Yes, the Home Smoke Eater uses filtering technology that is cabable way beyond just smoke. It can capture dust, pet dander, mold, pollen, bacteria, viruses and other airborne pollutants. Will it help my allergies or asthma? If your allergies or asthma are worsened by the smoke in your home, YES you should feel a noticeable difference as a result of the Home Smoke Eater pulling the smoke from the air. In general, the Smoke Stomper will create an environment free from the smoke, gases, fumes, odors and other airborne pollutants. As a result, many allergies and asthma symptoms can be lessened. Will it stop the walls and curtains from turning brown? It will definitely help slow that process down. The Home Smoke Eater will remove the tar, nicotine, smoke particles and other related pollutants that turn your home yellow or brown. Customers reported that the brown film on the windows and TV doesn't build up nearly as quick. While I would love to say it eliminates this completely, we get back to the same story. Nothing is instant or 100%, so there will be some exposure to the pollutants. Some people also notice that they dust less often in the rooms where the Smoke Stomper Home Smoke Eater is located. Does the Smoke Stomper Home Smoke Eater use Ozone? No, there is no Ozone produced by the Smoke Stomper. While there are certain applications where ozone makes sense, the Smoke Stomper does not need Ozone to handle tobacco smoke. Give us a call Toll Free 1-888-472-8736.